Ashwagandha (Withania somnifera) has a long history of use in enhancing innate resistance to disease and environmental contaminants. It is one of the most important herbs in traditional Ayurvedic medicine because it helps individuals adapt to stressful conditions, both mental and physical, and aids in maintaining a calm, positive mental attitude. 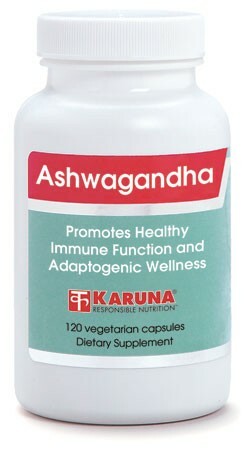 Ashwagandha is an all-purpose immunomodulator that also promotes healthy function of vital organs and helped improve joint function in one human trial, presumably due to its influence on prostanoids and acute phase reactants. It may be particularly helpful for supporting long-term health by maintaining the body's innate balance. Ashwagandha has been used for thousands of years to promote physical and mental health, and to enhance innate resistance to disease (American Herbal Pharmacopoeia & Therapeutic Compendium, April 2000). Ashwagandha helps support normal joint function (J Ethnopharmacol 1991;33:91-95). Ashwagandha helps support inhibitory effects on cyclooxygenase (COX) enzyme activity as well as suppressing the formation of several acute phase reactants (Indian J Exp Biol 1988;26:877-82). Ashwagandha beneficially modulates immune function (J Ethnopharmacol 1999;67:27-35). Ashwagandha helps the body adapt healthfully to the effects of environmental toxins (Pharmacol Res 2000;41:663-6). 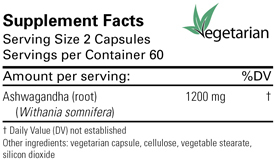 Suggested use for adults: 2-4 capsules early morning and afternoon, or as directed. Caution: Not appropriate for pregnant or lactating women.